Obituary – Cox, Faye Blanche (Wakeman) « Perry High School Alumni Association, Inc.
﻿Faye Blanche Cox, 88, of Perry, Oklahoma was the daughter of Scott Orlando and Jessie Emma (Jandera) Wakeman. She was born on a farm south of Perry, Oklahoma on December 14, 1914 and died at 12:15 a.m. Tuesday, April 29, 2003 at Perry Memorial Hospital. Graveside rites for Faye Cox and memorial services for her husband, T. Joe Cox, will be at 2:00 p.m. Thursday, May 1, 2003 at Grace Hill Cemetery. Rev. Tim Boggess will officiate. Interment will be under direction of Brown-Dugger Funeral Home. Memorials may be made to the Perry Memorial Hospital Auxiliary in care of Brown-Dugger Funeral Home. Faye received her degree in education from Oklahoma A&M at Stillwater, Oklahoma. 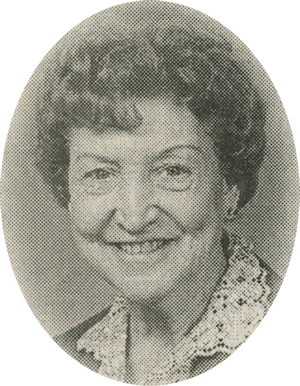 She taught at Hunter School, southwest of Perry, and Pleasant Hill School, northeast of Perry, and later taught second grade at Fort Bragg, California for 10 years. She and T. Joe Cox were married February 15, 1946. They were married 52 years before her husband preceded her in death. She was of the Presbyterian faith and was a member of the Moose Lodge and the Ladies Hospital Auxiliary at Fort Bragg. She and her husband enjoyed flowers and gardening and they traveled extensively. Faye was a kind and loving person to all who knew her and will be greatly missed. Faye moved back to Perry from Fort Bragg four years ago. Survivors are three sisters, Edna Frueh and Opal Thompson, both of Perry, Oklahoma, and Helen Richards and her husband, Donald, of Cheyenne, Wyoming; and several nieces and nephews. In addition to her husband, Joe, Faye’s parents, Scott and Jessie Wakeman, and one brother, Clyde Wakeman, preceded her in death.